Back-to-school season is an exciting time for kids and parents alike. The warm months leading up to the first day of school are usually filled with back-to-school shopping sales at stores offering everything from clothing and backpacks to all kinds of cool new school supplies. Today, those school supplies often include tech gadgets ranging from laptops and iPads to charging banks and docking stations. 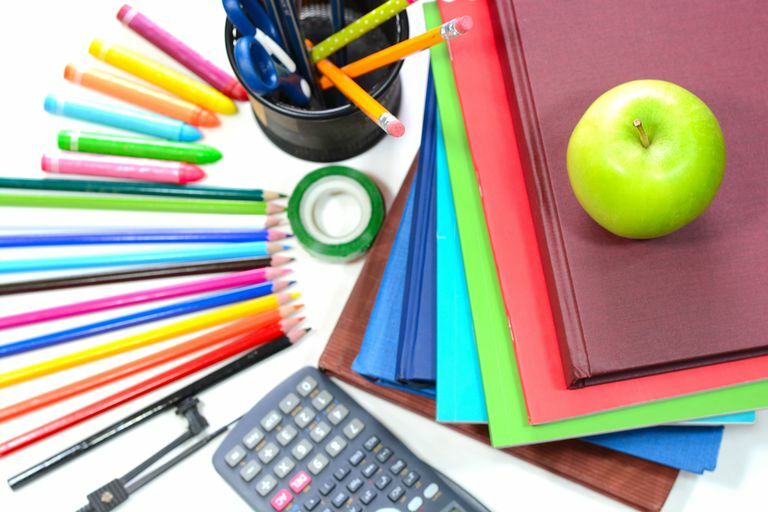 But, believe it or not, despite the age of technology, many back-to-school shopping lists are still filled with the same school supplies that were used years ago. For those of us who haven’t sat at one of those tiny school desks in a few years (or for some of us, decades, yikes! ), you might be surprised to find out that a number of our retro school supplies from childhood are still available today. There’s nothing like a classic, and this one keeps getting better every year. In fact, in May 2017, Crayola announced it was going to launch a brand new color inspired by the discovery of the YInMn pigment: the world’s newest shade of blue. This forward-thinking and classic approach to color is why nearly every back to school shopping list has to include a pack of Crayola Crayons. To be honest, I’m fairly sure I even brought a box to college. There was nothing better than cracking open a fresh box of those rainbow-colored wax crayons and seeing their perfectly pointed tips all lined up and waiting to be used. Crayola has never lost its luster and continues to develop not only the classic crayon but a number of other popular tools for inspiring creativity in both kids and adults today. One of the best parts of getting to write on the giant paper pads in my elementary and middle school classrooms was the chance to use the Mr. Sketch Markers. Those fruity-scented markers were a fan favorite and teachers loved them because of their no-bleed design that meant we could write on every page without an issue. If we ever were given a marker that wasn’t a scented Mr. Sketch, it was a huge letdown, but fortunately, those scented markers lasted forever, so as long as our classmates didn't swipe them, they would be available to showcase our creative color choices. It wasn’t enough to have any old binder in school back in my day; you needed to have the ultimate binder: a Trapper Keeper. Fortunately, this trendy and typically brightly-colored organizational tool was a life saver for many students. It was essentially a three-ring binder that held folders (which were called Trappers, thus the Trapper Keeper name, get it?). But, that wasn’t all. The Trapper Keeper was more than a traditional binder, it had a flap that fastened closed, sealing the specially-designed Trapper folders and all their contents safely inside, no matter what kids did to the binder. This was the ultimate design to keep kids’ work from floating all over the place, even if the Trapper Keepers were thrown and kicked around. This feature was especially handy back a few decades ago, during the days when everything was done on paper, long before we had laptops, tablets, and paperless classrooms. You never left home without your Trapper Keeper, and at my school, even if you wore a backpack, you still carried your Trapper Keeper in your hand to show off the colorful designs. For many students, the bright, bubbly, and bold stylings of Lisa Frank were a must-have. From unicorns and majestic horses to sea life and fairies, the colorful options were plentiful. The genius of the Trapper Keeper went beyond just the outer binder, as the Trappers that came with it were designed for students to prevent papers from falling out. Trapper folders were actually a result of scientific research and took inspiration from a West Coast product known as the PeeChee folder, which, unlike most folders, had pockets that were placed vertically. The vertical pocket meant that you would slide your papers into the side of the folder, instead of down into a horizontal pocket placed at the bottom. This meant that when you closed the folder, papers couldn’t slide out, unlike the typical horizontal folders which allowed papers to fall out the top if the folder was flipped upside down. The maker of the Trapper used that approach to the folder’s pocket placement (the PeeChee never made it beyond the West Coast, so there was an open market for it in other parts of the country), but with a slightly different design that included an angled portion of the pocket at the top. It worked so well that sometimes it was hard to get papers out of them (though, we may have shoved more papers in that we should have). Even better, the folders had nifty information printed on them, including multiplication tables, a ruler, even weight conversions. This usually meant that we had to put away our folders for tests, but it was helpful while we were doing homework. Your writing utensils were often an extension of your personality and creative genius and could make you the envy of everyone in your class. Those plain yellow No. 2 pencils just didn’t cut it in my classes; you had to stand out. Pencils that glittered, had cartoons on them, or were monogrammed with your name were a must-have to achieve cool status back in the day. Funky pens in every color were also a creative must-have, and everyone came to love the giant pens that allowed you to click between one of several colors. The more color options, the fatter the pen, but having the ability to write your essay in purple was worth it. The ultimate fan-favorites were the pencils that curled into various shapes like a pair of lips, a heart or even Mickey Mouse, which were cool, but super fragile and often broke. However, if you were lucky enough to not snap the funky-shaped pencils, these fun writing tools were a colorful part of the day. As if having cool pens and pencils wasn’t enough, you got bonus points if you also had an arsenal of funky erasers and pencil toppers. Those plain pink standard erasers were fine (they usually were the best functioning eraser), but the fun ones were scented, came in various shapes, and often were terrible at actually erasing. But, it was all about the look. Some students made sure that their pens and pencils were topped with a cool eraser or funky pom-pom (that wasn’t actually functional). During the holidays, it was a given that someone would have bells attached to their pen or pencil, jingling all day long and both amusing and annoying everyone around. A plain brown bag wasn’t cool enough back in the day. You had to have the hard-case lunch box complete with a thermos. These square boxes held your sandwich, snack, and drink and kept it cool until lunch. Some kids even brought soup to school in their thermos, which sometimes even had a special spoon built into the cap. The jury was always out on which pencil case reigned supreme: a cool zippered pouch or a hard-case pencil holder, but this was an organizational must-have, and at times even a required school supply. These simple pouches were a massive time-saver, making sure that students weren’t spending half the class digging through messy backpacks in search of the necessary supplies. Your pencil case held your pencils (naturally), as well as multi-colored pens, highlighters, erasers, and the ever-important pencil sharpener, because sometimes, you couldn’t get to the big sharpener in the classroom. Rulers, retractors, and a compass were also supplies that needed to be kept in the case. The fun part of pencil cases was picking the coolest one. Manufacturers were always coming out with new designs made with varying materials and shapes. There were the soft zippered pouches, which were usually easier to jam into your backpack, that were sometimes long and thin and didn’t hold a ton of supplies, and sometimes rather large to hold everything you owned in them. There were also the hard case designs, which made sure that nothing got smooshed or broken in your backpack. These were bulkier and sometimes harder to jam into your backpack, but made finding what you need super easy. Either way, your pencil case was an essential part of your school supplies. Yes, I listed a paper bag as a retro school supply. At some schools, paper textbooks don't even exist, but back in the day, textbooks were given out by the school and the same book was used for years. To protect them, we were sent home with instructions to cover them in paper bags. Today, students can buy pre-made text book covers that slip on easily and require minimal work from the user. But back in the day, we used the brown paper grocery store bags to cut and fold into a text book cover that we decorated. Doodles, an endless supply of stickers, or a carefully crafted single drawing made your textbook stand out and protected it from the wrath of a messy backpack. Believe it or not, notebook paper was considered a must-have, and the type of notebook you had was a chance to show off your cool school supplies. There were the giant five-subject notebooks that had pockets dividing each of the subject sections, smaller single-subject notebooks that fit nicely in your trapper keeper and could easily be popped out during class, the classic composition book, and the reams of pre-punched loose leaf notebook paper. Whatever your chosen notebook style was, an endless supply of blank lined paper was crucial. Bonus points if you found colored paper, though some teachers didn’t appreciate that. If you were one of those students who hated ripping pages out of your spiral-ringed notebooks, the loose leaf was a must and you always kept a stash of blank pages in the back of your trapper keeper. However, the bummer of the loose leaf paper was that flipping the individual pages endlessly through the three-ring binder (most likely the Trapper Keeper) meant that those tiny punch holes ripped constantly. Have no fear! Gummed patches are here! These little white donut-shaped disks fit perfectly over the pre-punched holes (if you could manage to line them up properly), and placing one on each side of your paper meant it was virtually indestructible, assuming you didn’t try to rip it.